Kerala SSLC Result 2016 is expected to be published on after April 25, 2016. keralapareekshabhavan has arranged all the facilities to deliver the SSLC results to the students. The SSLC result 2016 can be available on mobile through SMS. A mobile application Saphalyam 2016 has released on www.results.itschool.gov.in. The students can downoad this mobile application for getting SSLC results on android mobile. The Kerala SSLC Result 2016 is the most excited and popular public result in Kerala. More than 4 lakhs students appearing Kerala SSLC Examination every year. This year the SSLC Result 2016 will be published on April Last week. The sslc result can be accessed by Online or SMS through mobile phone. 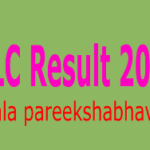 The leading news papers also publishing the result of Kerala SSLC/ THSLC 2016. The candidates who are not satisfied or not eligible for the higher studies with the SSLC Result 2016 can apply for SSLC SAY 2016 through the exam centers. The details of the SSLC SAY Application form and other details will be available from the exam centers. The candidates who are not satisfied with the scores obtained in the SSLC Result 2016 can apply for SSLC Improvement Exam 2016, The SSLC Improvement Exam Application form and other details will be available from the schools.